Juicy boneless chicken prepared in a rich makhani gravy. 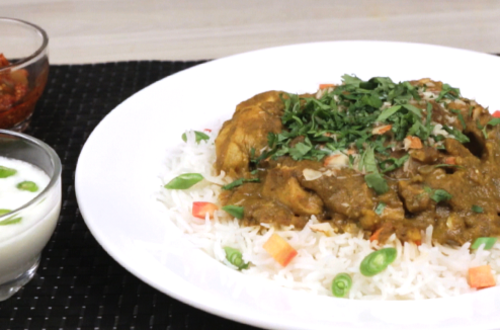 A dish so tasty, you will want to have an extra phulka with it. 1 Grind the onion and green chillies to make a smooth paste. 2 Combine the onion-green chilli paste, ginger-garlic paste, Knorr Chef’s chicken masala, red chilli powder and coriander powder. 3 Smear the marinade over the chicken along with bell pepper and marinate this for 1 to 2 hours. 4 Heat oil in a nonstick pan on a medium flame. 5 Add marinated chicken and cook for 5 to 6 minutes. 6 Add tomato puree and add salt to taste. 7 cook until chicken becomes tender. 8 Add low- fat fresh cream and honey. 9 Garnish with chopped dry fruits and coriander leaves.